Have you ever wondered about the secret to pulling off a simple outfit of jeans and a button-down top? It all comes down to one styling trick that fashion girls have mastered: the sleeve roll. Yes, rolling the sleeves of a button-down top is an insider way to make the everyday basic look chic and elevated. Not only does it give any outfit a relaxed, cool-girl feel, but it also puts the emphasis on any jewelry on your wrists or accessories you’re carrying. Ahead, we’re breaking down how to roll sleeves in three easy steps. Step 1: Unfasten any buttons on the sleeve cuffs. Step 2: Fold your sleeves in half, and pull the cuff to the upper arm. Step 3: Roll the sleeve fold again, stopping right below the cuff. Let the cuff stick out from under the fold. Go on to shop our picks for button-down tops. 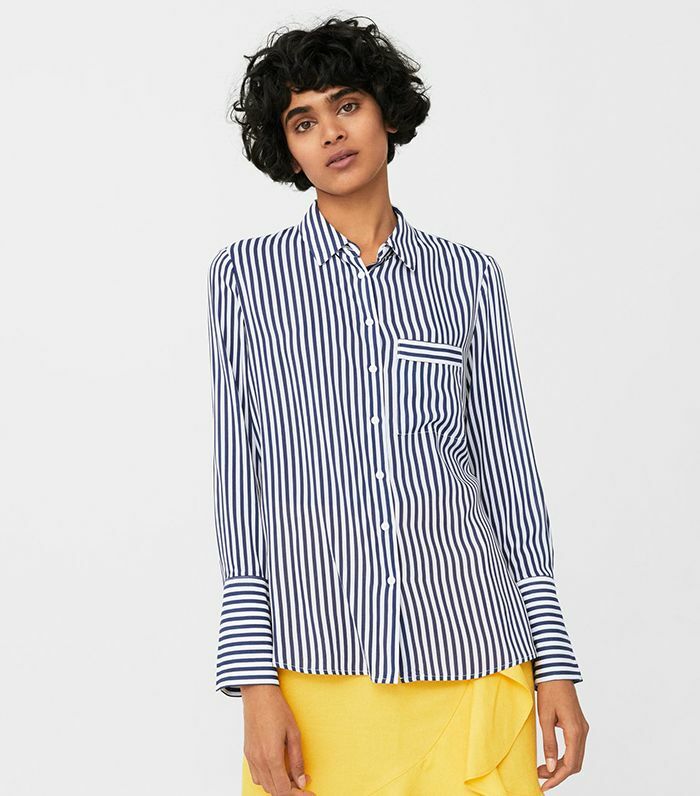 Wear a pop of color with this striped shirt. This top is perfect styled with white jeans for a night out. We love the tie detail on this shirt. Wear yours with black trousers and statement earrings. A button-down is stylish with a black leather skirt. Every wardrobe needs a denim shirt. Update your white button-down with ruffle details. Opt for this denim patchwork shirt. A colorful button-down is just what your wardrobe needs. A classic white button-down and denim is our favorite outfit. Style this shirt with distressed vintage jeans for a casual look. Polka dots are both classic and timeless. Wear this button-down with dark-wash denim for a sophisticated look. We love the trendy velvet update on this classic silhouette. Fashion girls style this top with neutral pants. Pair this neutral top with cropped flare jeans.